Mobile Services are becomming more and more common. Seven years ago I had the opportunity to develop some simpel SMS services, and SMS services is still the most common form of Mobile Services, though the mobile web is picking up momentum as well as custom Mobile Aplications. I decided to have a look at Mobile Services and to start with building a simple SMS Service. This blog post vil cover the basic setup and a later post the service part itself (though it's fairly easy). Back in 2002 the company I worked for used both a commercial SMSC with billing etc., but we also ran our own SMSC to receive data carried by SMS. For our own SMSC we used Kannel which was quite easy to setup and run. I was please to see the Kannel project is still running. I started by downloading the lastest stable release (version 1.4.3). Installing on my Fedora 10 Linux distribution was an easy classic ./configure, make, make install. The binary distribution comes with a sample SMSC configuration in the gw/smskannel.conf file. I only needed to update it with my local settings which involved figuring out the way to hook it up to my modem (the only part that was a bit problematic back then with a serial interface). I have a Mobile Broadband ISP (flatrate) that comes with a USB modem (3G). The modem has the name E180, and can be seen on the Huawei device website HUAWEI E180 - HSPA USB Stick. The short specification list is: Support 2Mbps (5.76Mbps ready) HSUPA and 7.2Mbps HSDPA services Support SMS and Voice services. To find the manual is quite har since it's not available from Huawei's own support site, so through Google I found it [PDF] at the South African company Maredi's website. It carries the subtitle as flexiable as wings and it certainly is easy to use on both Linux and Windows, though I'm not sure I really like the metaphor on airplane wings. Mar 28 07:47:29 kannel NetworkManager:   (ttyUSB0): deactivating device (reason: 2). # This is a fake smsc connection, _only_ used to test the system and services. # It really cannot relay messages to actual handsets! 2009-03-28 07:55:26   WARNING: DLR: using default 'internal' for storage type. 2009-03-28 07:55:26   INFO: HTTP: Opening server at port 13000. 2009-03-28 07:55:26   INFO: BOXC: 'smsbox-max-pending' not set, using default (100). 2009-03-28 07:55:26   INFO: Set SMS resend frequency to 60 seconds. 2009-03-28 07:55:26   INFO: SMS resend retry set to unlimited. 2009-03-28 07:55:26   INFO: DLR rerouting for smsc id  disabled. 2009-03-28 07:55:26   INFO: DLR rerouting for smsc id <(null)> disabled. 2009-03-28 07:55:34   INFO: AT2[/dev/ttyUSB1]: AT SMSC successfully opened. # applied, using the first one to match. # other 'sms-service' is applied. This is the most simple service just serving a static string (the value of text). The other and dynamic ways to respond to these requests I'll cover in another post. 2009-03-28 08:03:44   INFO: HTTP: Opening server at port 13013. 2009-03-28 08:03:44   INFO: Connected to bearerbox at 127.0.0.1 port 13001. Using Kannel is still very easy to both compile, configure and run. As annonced in the last release note "Digitaliser.dk - nu med offentligt API og medlemspolitik for grupper og rig tekstredigering" this is based on (OIO)REST with POX responses. The documentation is in the form of endpoints and XML Schemas for the responses, and can be read online: http://api.digitaliser.dk/rest. I have practically no experience with REST, so I started to google for hints on have to call a REST webservice with Axis2. I did'nt find much and it seem way to complex for likeing. I did found out that REST/POX services can be described with WSDL 2.0 Part: 1 and WSDL Version 2.0 Part 2: Adjuncts. I do not find these as easy reads so I looked for an example and found a post on Keith Chapmans blog "RESTfull Mashup with WSDL 2.0 - WSO2 Mashup Server". The WSDL for this exmaple. Another resource that I haven't really read yet is Lawrence Mandes article on IBM DeveloperWorks called "Describe REST Web services with WSDL 2.0". Eksternal schemas can/must now be imported directly in the types section - no need for a wrapper schema anymore (and it will not work). Look at example 3-4 in the WSDL 2.0 primer or Importing XML Schema in the standard. Even though it would be the easiest just to have a simpletype element for the request parameter in this example, I have to use a wrapper. The reason I guess is that this model can handle any number of parameters, where the case with just one is the simplest. @signature attribute does a reference to child elements in the wrapper defined in the former bullet. from here it's easy writing a simple client program. The request param is a little clunky since I'm using XMLBeans, but that's fine with me. I added a very basic validation method that should be enforced if I were to use this for real. Notice that I changed the endpoint to let it run through TCPMon and now finally lets have a look at how it looks like on the wire. The HTTP headers sent back is just plain, except that were informed that it's based on the Noelios Restlet Engine (NRE). Here's hte body sent back containg the resource strcuture as defined in the XML Schema. In my last post I had a look at Web Services Notification (WSN). In this post I'll see what Web Services Eventing (WS-Eventing) has to offer. Where WSN is a formal OASIS Standard Web Services Eventing is currently only a Member Submission to W3C back in March 2006. The list of vendors behind the specification are most of the big players like for WSN with the big difference that Microsoft is participating. I haven't done a formal comparison but there seems to be quite a overlap between Web Services Notification and Web Services Eventing. The full text [PDF] can be found on intels website or in googles cache from Microsofts website. To my knowledge this never materialized, but maybe this is what turned up as a new working group at W3C. The definition of basic Create, Read, Update, Delete (CRUD) operations that provide capabilities to create, read, update and delete a Web Services XML representation and the binding of these operations to SOAP. The thing that jumps into my eyes is how RESTfull this sounds! The current editors draft of WS-Eventing is available online as promised. Judging from the issues related to WS-Eventing convergence doesn't seem to be on the agenda. The delay in reconciling WS-Notification and WS-Eventing shows that the Web services standardization process has lost momentum. Standards have remained static for the past year, permitting only primitive interoperability. From my point of view Event Driven Architecture (EDA) is part of SOA and typically run with push(like) setups (pub/sub). Most of the SOA talk has been on request/response oriented setups, probably cause by the common usage of HTTP and no agreed upon interfaces for subscriptions/topics. In this blogpost I'll have a quick look at the OASIS standard Web Services Notification (WSN). The OASIS WSN Technical Committee will coordinate efforts with the OASIS Web Services Resource Framework (WSRF) Technical Committee (also announced today). Members of the OASIS WSN Technical Committee plan to conform their work to the implied resource pattern specified by WSRF and will make use of WSRF specifications concerning lifetime and properties. There are certainly a lot of big companies supporting (with a degree of holeheartness), but in my view Microsoft is missing and to some degree Sun. Amberpoint, Fujitsu, and IBM have all implemented WS-Notification either internally or externally (in keeping with the consortium's requirement that at least three parties assert successful implementation prior to OASIS Standard balloting). Fujitsu's implementation is available as open source tool through unicore.forge.net. The Apache Muse Project is a Java-based implementation of the WS-ResourceFramework (WSRF), WS-BaseNotification (WSN), and WS-DistributedManagement (WSDM) specifications. It is a framework upon which users can build web service interfaces for manageable resources without having to implement all of the "plumbing" described by the aforementioned standards. Applications built with Muse can be deployed in both Apache Axis2 and OSGi environments, and the project includes a set of command line tools that can generate the proper artifacts for your deployment scenario. The implementation of WSN is only partial, with only WS-BaseNotification of the three specifications that make up the standard. Update: IBM has support for WSN in their WebSphere suite. let's look at their goals and requirements. The goal of WS-BaseNotification is to standardize the terminology, concepts, operations, WSDL and XML needed to express the basic roles involved in Web services publish and subscribe for notification message exchange. The specifications must be factored in a way that allows resource-constrained devices to participate in the Notification pattern. Such devices will be able to send information to, and receive information from Web services, without having to implement all the features of the specifications. There must be a mechanism that lets a potential Subscriber discover what elements are provided for subscription by a NotificationProducer, and in what formats the subscription for notification can be made. Transport protocol details must be orthogonal to the subscription and the delivery of the notifications, so that the specification can be used over a variety of different transports. Must allow for Message Oriented Middleware implementations. The design of the WS-BaseNotification must allow a service that is acting as a NotificationProducer to delegate its implementation of WS-BaseNotification semantics to a Message Oriented Middleware provider. WS-BaseNotification must be composable with other Web services specifications. The goal of WS-BrokeredNotification is to standardize message exchanges involved in Web services publish and subscribe of a message broker. The overall requirements of WS-Notification are presented in [WS-BaseNotification]. The following section lists the specific subset of those objectives realized by WS-BrokeredNotification. Must allow for a notification broker as an intermediary. A NotificationBroker is an intermediary Web service that decouples NotificationConsumers from Publishers. A notification broker can relieve a Publisher from having to implement message exchanges associated with NotificationProducer; the NotificationBroker takes on the duties of subscription management and distributing Notifications on behalf of the Publisher. It implements NotificationProducer interface. It may implement SubscriptionManager or may delegate the subscription management work to another component. Must allow for federation of brokers. It must be possible to build configurations with multiple intermediary broker services in a dynamic fashion. This specification must allow for a variety of broker topology usage patterns. Among other things, these allow for greater scalability and permit sharing of administrative workload. There must be a mechanism that lets a potential Subscriber discover what elements available for a subscription are provided by a NotificationBroker, and in what formats the subscription for a notification can be made. A NotificationBroker must support required message exchanges defined by the [WS-BaseNotification] specification. It must conform to the NotificationProducer and the NotificationConsumer interfaces defined in WS-BaseNotification. WS-BrokeredNotification must be independent of binding-level details. Must not exclude non-service producers and subscribers. WS-BrokeredNotification design must not exclude a non-service entity to deliver a notification message to a NotificationBroker. It must not exclude a NotificationBroker to send a notification message to a non-service consumer. WS-BrokeredNotification must define standard message exchanges for registering a NotificationPublisher with a NotificationBroker. The goal of the WS-Topics specification is to define a mechanism to organize and categorize items of interest for subscription known as “topics”. It defines a set of topic expression dialects that can be used as subscription expressions in subscribe request messages and other parts of the WS-Notification system. Must permit transformation and aggregation of Topics. It must be possible to construct configurations (using intermediary brokers) where the Topic subscribed to by the NotificationConsumer differs from the Topic published to by the NotificationProducer, yet Notifications from the NotificationProducer are routed to the NotificationConsumer by a broker that is acting according to administratively-defined rules. Must permit non-centralized development of a topic tree. It must be possible for actors to define additional topics based on existing topics without requiring coordination with the actor responsible for creating the topics that are being built on. If I were to spot the "Achilles' heel" of the WS-* stack, it must be the lack of a standard to really replace the classic messaging setups like ex. JMS, though that was what many set out for. It took an incredible long time to finally get something like WSN and even more importantly WS-RX. And that is just the standards - then you have to wait for at product near you to support it! In the meantime some has lost confidence (and maybe gained productivity) but using more propriotairy standards making it even harder to gain critical attraction. Doing a web search for wsn gives far fewer interesting hits than I would have liked to see. This indicates to me that though WSN has alot to offer the real usage is strongly limited. I want to get back on track with my WCF certification and the best thing to do seems to be rolling a service myself. I've had this post in draft for almost two years now so it's about time i finalize it! 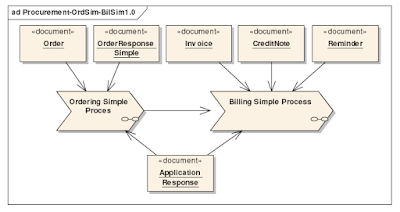 To save myself from yet another uninspiring hello world example I've decided to base it on a simple document flow that's part of a basic OIOUBL process " OIOUBL BASPRO - Basic procurement Cycle [PDF]. This will not only give my webservice a touch of the real world but I'll also update my knowledge of OIOUBL slightly. 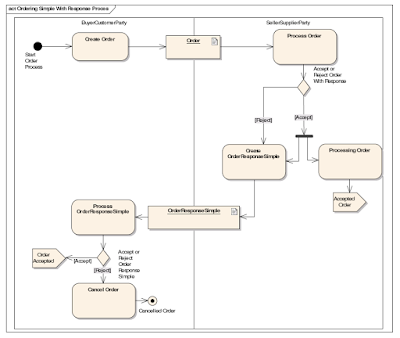 There's a complete package to download from oioubl.info and this one is called Basic procurement Cycle (Ref. S03) [BASPRO.zip]. As mentioned above, OIOUBL is a subset of UBL 2.0. This means that UBL 2.0 contains a number of business documents in addition to the ones in OIOUBL. For example international transportation documents. These additional business documents are fully compatible with and may be used with the OIOUBL documents. However, no Danish language instructions or guidelines are provided for these documents. The OIOUBL specifications are based directly upon the UBL 2.0 XML schemas. No additional XML schemas have been developed or are required for OIOUBL. It should be noted that, for business reasons, a few elements from the UBL 2.0 schemas have been excluded in the OIOUBL customization. These elements have been judged as not applicable in Denmark, either because of specific Danish legislation, or because they are of not relevant in a Danish context. These omitted elements will not be present in the OIOUBL specifications, and if these fields were to be used they will not pass the document validator published by the National IT and Telecom Agency. So contrary to the first Danish adoption to UBL, here no special schemas so I can use the one from the OASIS website UBL-Order-2.0.xsd. The rest is just boilerplate WSDL. I've uploaded the WSDL SX_OIOUBLorderDemo.wsdl to digitaliser.dk (the successor of the InfoStructureBase). It's still open to anyone, and the biggest change I've found is that once you've made anything public it can't be edited! Not the file (artifact) nor the resource (metadata), the only way is a new version of the resource.